In this article, we are going to create a small 3D scene, where the user can scroll on the z-axis. You can find the final code of this tutorial on github, and the demo if you follow this link. This article assumes that you already have some knowledge about CSS and JS. We are going to use CSS custom properties, if you are not familiar with this you can read CSS custom properties - Cheatsheet. When speaking of CSS 3D, we really speak about CSS3 transform 3D. This method allows us to use the transform CSS property to set perspective or rotation on the z-axis to our DOM elements. The transform CSS property lets you rotate, scale, skew or translate an element. It modifies the coordinate space of the CSS visual formatting model. 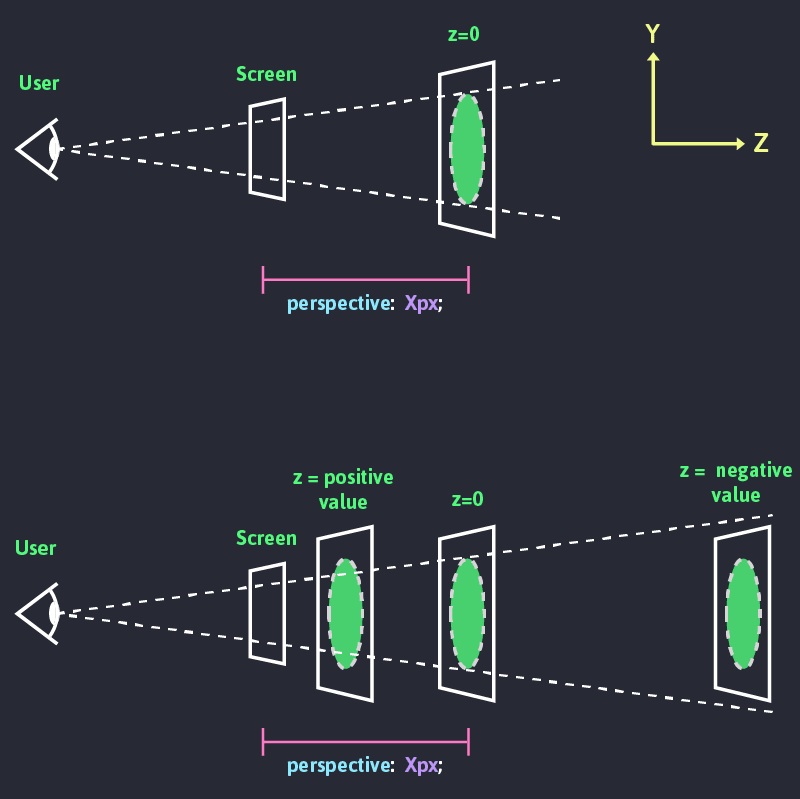 perspective is a CSS property that set the distance between z=0 and the user. The smaller is the perspective value the greater will be the distortion of our see. (Try to change the value of scenePerspective in the codePen example below). The value of perspective is a length unit. Try to set the value of scenePerspective to 0 and 70 in the example below. You can notice that our cube get no perspective at all if its value is set to 0. If the value is set to 70, you can see a really strong distortion of the cube perspective. The smaller the perspective value is, the deeper it is. To be able to render a 3D space, we need to specify transform-style: preserve-3d; on the child elements. In the above example, it set to our .cube. By default, the elements are flattened. The perspective-origin CSS property determines the position at which the viewer is looking. It is used as the vanishing point by the perspective property. This property basically allows us to move the vanishing point of our 3D scene. In the following example, you can change the value of perspectiveOriginX and perspectiveOriginY. We already mentioned earlier that the transform CSS property allows us to set our elements in a 3D space. As we saw in the illustration in the perspective section. translateZ() allows us to position an element along the z-axis of the 3D space. Alternately we can use the translate3D(x, y, z) CSS function. In the following example, you can play with the Z-axis position of the .cube and .face- by changing the value of cubeTranslateZ and cubeFacesTranslateZ. Now that we have a good understanding of how CSS 3D works we are going to create a 3D scene, where we are going to be able to scroll on the z-axis. We are going to create a page that lists out all the films of Studio Ghibli. Each film is going to be a card positioned on the z-axis of our scene. Feel free to fork or download the following codepen as a starter material to follow along. I'm using axios with Studio Ghibli API to populate this page. First, we are going to set our CSS custom properties (CSS variables). Some of these variables are going to be transformed using JS. They are going to help us to interact with the scene. .viewport will allow us to set the height of the window. We will later use it to set the depth of the scene and use the scrollbar to navigate in the z-axis. .scene3D-container sets the scene perspective and the perspective origin. It is position fixed so it stays always on screen. We are as well going to set the perspective origin. .scene3D sets the position of our scene on the z-axis, This will behave a bit like moving a camera on the z-axis. But really we are moving the scene and the camera (viewport) is fixed. In the rest of this article, we are going to use the camera comparison. .scene3D takes the full height and width of the viewport. Last but not least we are going to position our cards in the scene. All items are position absolute. Odd items are position on the left, even ones on the right. We use SCSS to programmatically translate each item. On the X and Y axis we randomly translate them between -25% and 25% for X, between -50% and 50% for Y. We use a @for loop so each item can be translated on the z axis multiply by their indexes. To be able to scroll, we need first to set the value of --viewportHeight which emulates the depth of the scene. 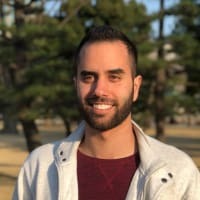 Let's create a setSceneHeight() function that will update the value of --viewportHeight on load. Our page has now a scrollbar, but we are still unable to scroll. We need to add an event listener that will listen to the user scrolling. The scroll event will call a moveCamera() function. It will update the value of --cameraZ with the value of window.pageYOffset. Finally, let's make our scene a bit more dynamic. On mousemove event we are going to change the values of scenePerspectiveOriginX and scenePerspectiveOriginY. This will give the illusion that the camera move. The items will stay straight in the scene. If you want to give a more realistic camera rotation movement, you could apply rotate3d() on the scene. First, we are going to store the initial values of these two variables in a perspectiveOrigin object, we are going to set a perspectiveOrigin.maxGap value which is going to limit the maximum and minimum values of the variables. For example if scenePerspectiveOriginY is equal to 50%. On mousemove, the new value will be between 40% and 60%. If the user cursor is at the centre of the screen, we will set the values of --scenePerspectiveOriginX and --scenePerspectiveOriginX as the initial ones. The further the cursor moves away from the centre, the bigger will increase/decrease these values. If the user moves to the top left corner the values will increase, on the bottom right corner they will decrease. xGap and yGap return the mouse position of the user in percentage on the X and Y axis, compare to the centre of the window. newPerspectiveOriginX and newPerspectiveOriginY return the new perspective origin. We are an 18-strong digital agency with a track record of delivering beautiful solutions to client problems – fast. We’ve built our business based on reputation and recommendation and are proud of the long relationships we have with our clients. 🤯I'm mind blown, this is amazing! Thanks for sharing! This was awesome! I have the perfect project to use it on. Thank you sir!! This a very creative use of css and has a really enjoyable result, thanks for sharing! Wow. This article is for me like CSS sci-fi. Wow. This so cool!!! I really liked it! This is one of the coolest things I have seen. Thanks for sharing this!